In the places where I work, ice forms on its own, without our handiwork. Whole rivers freeze up in the winter. I learned to drive on ice when a lover took me out onto a frozen lake, warned me where the thin places were, and put the wheel in my hands. In the ice fields of Southeast Alaska, snowpack collects, compacts, recrystallizes into “firn,” and then into glacial ice which—dense and plastic under its own weight—bends slowly downhill, cheesegrating mountains apart as it moves. Glacial ice is sometimes the bluest blue you’ll ever see—swallowing all the other colors in the light spectrum and scattering back blue like turquoise stones, blue like sapphires, blue like evening sky. But mostly, it is filthy. It carries mountain dust, boulders. Standing in the crackle and drip of an ice cave feels like standing in a galaxy. Suspended rocks spread out behind the slick walls of ice like so many suspended stars. It is remarkable, and unmarketable. But ice—slow-frozen and wild-harvested or manufactured for consumption—fascinates me in its allure. Which types of ice are sellable, and which evade easy packaging? This is the subject of my Tiny Cabinet this week: an exploration of melt, value, fetishism, and intangibility. 1. In the lung-chilling darkness of Alaskan midwinter, an ice sculptor raises a chainsaw at the feet of a reclining goddess. He moves lumpily, weighed down with bulky clothing and slowed by the frozen sheet of ground underfoot. Even in the perpetual Alaskan night, the goddess shines. Her belly, her fine strands of wind-caught hair, a scissor-tailed bird defying gravity at the tip of her outstretched arm—all these catch and scatter the sparkle of streetlights. The sculptor and his team have spent six marathon days carving her out of dense blocks of ice lifted from a groomed pond near Fairbanks. The pond is dredged every summer to prevent algae growth and bubbles; in the winter, it is scraped free of insulating snow to facilitate deeper freezing. On harvest day, the blocks are cut free and plucked up by forklifts. The ice is so clear that a newspaper can be read through it as through glass; it’s so pure that ice carvers around the world call Fairbanks ice the “Arctic Diamond.” It is, they say, the best ice in the world. 2. A glacier might take 2 years to compress ice out of packed snow, yet the frozen water we make in minutes is chemically identical to the ice we harvest. In other spheres, we’ve done a good job manufacturing look-alikes and derivations of nature. Willow bark containing salicylic acid—a powerful pain reliever—is synthesized in labs now as acetylsalicylic acid. Almost as good as the original, except that it can cause internal bleeding. We’ve largely traded the wandering chemical pathways of rubber from trees for the tidy chemical organization of synthetic rubber, made from petroleum. Although the two look and feel alike, their insides share little in common. But ice? Lay an iceberg and an ice cube sheared off, side by side, and you’ll find their chemical structure to be the same. They hover at the same temperatures, they share the same physical and electrical properties, the same viscosity and heat of fusion—even the same density. Ice crystals from glaciers are slightly larger than ice-box crystals, and so a chunk of wild-harvested ice might last a little longer in your drink, but beyond that? We have manufactured frozen perfection. Our freezers may as well be microcosmic ice ages; our cocktails adrift with sea ice, to scale. "Diamond Dust- A Voyage into the Kingdom of Ice and Snow" from Armands Pundurs on Vimeo. 4. In conditions below -40°, “diamond dust” forms: drifts of airborn ice powder that whorl like storm systems across the landscape. When we admire a person’s diamond jewelry, we call it “ice.” One of the oldest terms for “grading” diamonds serves as a reference to ice: a diamond of the highest quality is a “diamond of the first water.” The matchless “Arctic Diamond” ice from Fairbanks shines like a clear gem. Diamonds and ice both share similar cubic crystalline structure. They are both strong enough to carve through rock. At their most beautiful, they are the product of outrageous time and pressure. They are translucent, chiseled cages for light. Both are shipped across oceans, marketed at extraordinary prices, served glittering in the bottoms of effervescent cocktails, sliced from their resting places and carted across continents. Ice, though, can break between our fingers, can ghost like a trapped animal set free. Diamonds are forever. Ice melts. For the first time in human history, ships are successfully transiting the Northwest Passage, which Francisco de Eliza and Franklin and Cook and Vancouver all sought so hard to find and travel. Arctic ice pack has diminished enough that the passage is navigable now for regular marine shipping. Cargo vessels ply the waters and bigger and bigger cruise ships are offloading tourists among the sea birds and Inuit of the far north. Extinction tourism in action. On the far side of the world, a Norwegian startup is preparing to chunk ice off of a receding glacier (the nice, clean blue kind) to airmail to clients in Dubai, Los Angeles, Tokyo, carbon footprint be damned. “Our product is 100 percent natural, more than a thousand years old, and very luxurious." Last week, I drove with friends through the night desert to an ice bar in Phoenix. We were given parkas (extra charge to upgrade to faux fur) and plastic cups full of beer and were shuttled through an airlock painted with supersized penguins. Inside, dual projectors cast approximations of the Aurora across thick walls of ice chiseled to look like mountains. Benches and shuffleboard tables made of ice glittered under the blue lighting in the room. 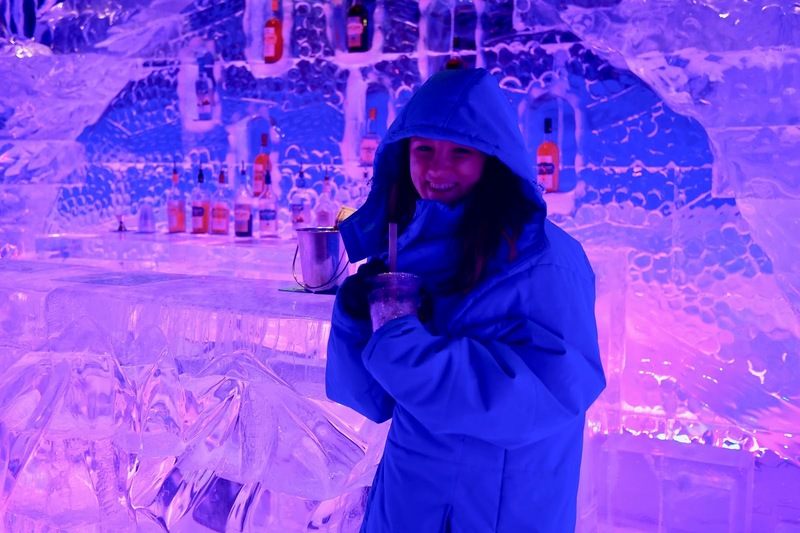 An ice luge shaped like a seal perched on a bar carved entirely out of ice. Walruses, bears, and penguins sparkled at the edges of the bar, blockier and more primitive than the grand ice carvings of Fairbanks, but this was the desert, after all. I spoke with a manager who wore an orange puffy coat and waxed wistful about bigger ice bars in places like Las Vegas, where “you’re not even allowed to take pictures—you’ve got to pay $50 to see the inside for yourself. But I hear it’s really stunning, those ice sculptures.” I learned from her that an individual wall in the room here cost about $10,000 to carve. “We keep it cold, so it usually lasts around five months,” she said, and then: “Sir! Sir! You’re going to have to leave,” as a dude on the other side of the room attempted to climb atop a polar bear made of very expensive-looking ice. As ice becomes rarer, we fetishize it. Witness the disappearing Arctic. Taste time in your glass. Ride a polar bear. When it melts, we can always make more.